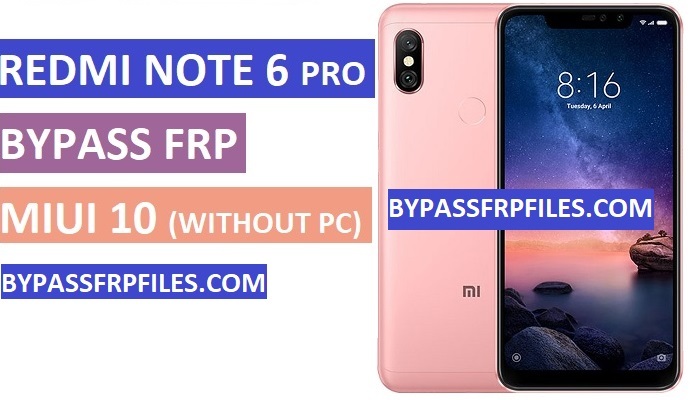 Redmi Note 6 Pro is latest release by Xiaomi, Redmi Note 6 Pro comes with latest update of MIUI 10, Now here we share with you guys latest process to Bypass FRP Redmi Note 6 Pro-MIUI-10 very easily, follow this guide if you need a working great solution to reset FRP lock from your device even without using any computer, This is the latest method that we found while we try to Bypass Google FRP Redmi Note 6 Pro. Note:- This method we tried to Bypass Redmi Note 6 Pro FRP. FRP is (Factory Reset Protection) for our Latest Android devices, if you forget the Pattern, Password and fingerprint lock for this you have to hard reset your device by using keys, after you hard reset your device then you need to enter the previously synced Gmail ID to using your access your device home screen once again, then why we need to Bypass? its very simple answer if we forget the Gmail ID that we enter synced previously on our device, then you need to Bypass FRP Redmi Note 6 Pro and use our device once again. -Boom, Now you will access “Browser” successfully, download Redmi Note 6 Pro FRP File to successfully Bypass Google FRP Redmi Note 6 Pro. -Download the below following file to Bypass FRP Redmi Note 6 Pro. Wow impressive, now you can successfully your device home screen but still FRP is on, now follow the FRP remove steps from below to successfully Bypass Google FRP Redmi Note 6 Pro. -Then you will get another popup, tap on the “Enable” button from that popup to Bypass FRP Redmi Note 6 Pro successfully. -Now check you have successfully Bypass Redmi Note 6 Pro FRP. Thanks for visiting us, if you facing any problem with this Bypass Google FRP Redmi Note 6 Pro (MIUI-10) Without PC, comment us below.